This walk is a fairly obvious one which folllows the B road out of Cromarty heading west all the way to the A9 and then follows the main road bridge over the Cromarty Firth. A long walk today along fairly boring stretches of straight B road which fortunately wasnt too busy. I spent a long part of the walk discussing the meaning of life as usual with Audrey. Actually it was all about determinism versus free will, and whether the future could be altered by actions in the present. Totally pointless philosophical argument as most are, but managed to take my mind off the road for a while. 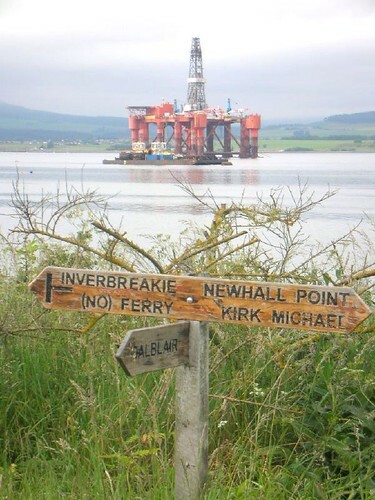 The walk allowed me to understand the importance of the Cromarty Firth, both as a deep sea port for Rig manufacture, and as a haven for warships in the second world war. It was about 18 miles of walking west and more back east on the other side just to cross a stretth of water which must be at the most half a mile across at the mouth between the Sutors. You are currently browsing the Scottish Coastal Walk blog archives for the day Monday, July 3rd, 2006.